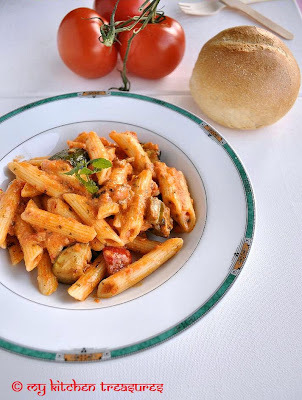 My Kitchen Treasures: Penne with Tomato Sauce and Roasted Vegetables. Have a great time, see you in July. 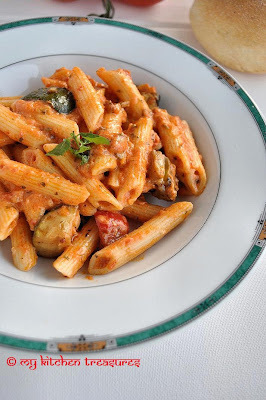 This penne pasta sounds so good with roasted vegetables! Yum! Oh my goodness, looks so great. Guess what? I was planning to make this tonight but I am skipping capsicum and adding zucchini instead. My daughter loves pastas much, roasted veggies with penne would have tasted more delicious na, tempting dish looks very catchy.. I can't eat veggie with plain salt and pepper! Definetly bland diet food, i love to spice up and make it different according my mood of course! The pasta dish is very inviting! I am so making this ASAP. Looks absolutely delicious! have pasta, have few veggies...now i know whats for lunch..will be trying this one out today..will let u know how it turns out...Im salivating already! wow, this looks so yummm..will try this one for sure, since I am a vegetarian and this looks real tasty..
Love any kind of pasta dish with vegetables. Looks delicious with the vegetables! I love penne pasta...had it for dinner last night...but I made it simple ..minus the veggies. Hubby dear is travelling..so I made a simple meal. just wanted to tell u i tried this and it was nothing short of YUM! just fab!! though maybe next time I would cut the oil a bit..
S that was fast. I am glad you enjoyed it. I think I have written if you don't want to add the oil to your pasta you can pour it away after roasting the vegg. Pasta with roasted veggies sounds delicious... Mouthwatering pic. What a wonderful pasta dish! So summery and sunny. wow I love this colourful pasta dish! Very very yummy. My hubby thinks the same way as your hubby when it comes to vegetarian food -- but I bet if I make this for him he would absolutely love it! It looks fantastic and full of flavor! This sounds completely delicious with all those roasted vegetables! Roasting brings out such amazing flavor! Love recipes like these - so simple but so nice and so complete! Oh that is so tempting.. I make something very similar and bake with some cheese and bread crumbs. It's my kind of pasta... Just the way i love :) Yumm! this is such a classic vegetarian pasta dish. YUm! Manasi sure will send this to your pasta night.